Monday, December 17, 2018 — Can’t decide if it’s cheaper to travel to Osaka or Taiwan? 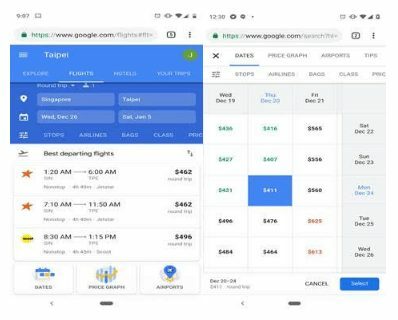 Starting today, Google Flights will be rolling out on Google Search to make it easier for Singaporeans to find travel inspiration and search for the best available flight options. You can simply type “Flights to Osaka” or, go directly to Google Flights to quickly and easily compare and book flights in $SGD – from your mobile device, tablet or desktop. Singaporeans are always on the lookout for the best deals. With Google Flights, you can easily compare flight options based on your preferred dates, pricepoint, airlines, connecting airports or even explore flying to alternate airports. Have the travel bug and not sure where to go next? How about some weekend getaway inspiration? Try using Explore on Google Flights to get ideas on where to go based on popular destinations or activities you want to do. If you want to get away for a holiday next month just choose “January” and a trip duration like “2 weeks” to see the dates with the lowest prices to visit each place. Once you select your departure and return dates, you’ll be presented with a list of ‘Best departing flights’ which represents the best tradeoff of convenience and price. Before you select a specific flight, you may see a notification bar with tips on how to find the best price for this route. If you’re still unsure about making that booking, you can choose to track a flight and receive email notifications to monitor price changes and travel tips. Whether you’re ticking off your bucket list or taking a quick business trip, our goal is to help you find the best flight with confidence so you can plan, book and take off in a couple of clicks!